A group of residents suggested Modified Ballot Measure A language to the City Council prior to approval of the Measure Ordinance to more accurately reflect the cost and scope of the proposed project. Petitioned and proposed 75-word modification to ballot measure statement to help clarify Measure A to voters. Proposal Denied. Here is the official Primary Argument and Rebuttal Opposing Measure A and proposed Hillview Community Center Project. This is what voters will see in their ballot materials in mid September. Ballots will arrive after October 5 and all voting ---mail in and walk in --must be completed by the election on November 3, 2015. Think about the real cost to homeowners of a $65 MILLION debt that when paid back EXCEEDS $100 MILLION, including interest. PLUS– $25 MILLION OF CITY RESERVES that will forego funding other city services, emergencies or citywide needs. PLUS – UNKNOWN OPERATING COSTS (maintenance, utilities, insurance) not included in this proposal. The proposed 55,600 square feet facility is THREE TO FOUR TIMES THE SIZE OF COMMUNITY CENTERS in demographically comparable cities, and the Multi-Pool Swim Complex prioritizes competitive team use and training over recreational swim. 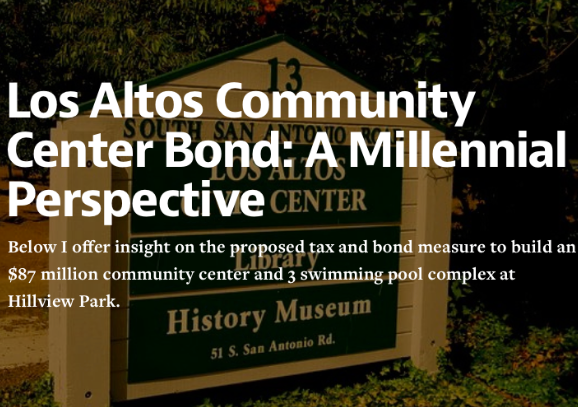 Expanded community facilities sized for conferences, unknown programs and rentals----with no understanding of operating costs, staffing, maintenance ---LEAD TO UNADDRESSED REVENUE EXPECTATIONS AND TRAFFIC on Los Altos thoroughfares and neighborhoods. WRONG PRIORITIES: LITTLE VALIDATED SUPPORT. The Community Center and Multi-Pool Swim Complex are fixed to the Hillview Park location, and DO NOT INCLUDE SERVICES LIKE the LIBRARY, PUBLIC SAFETY, or address Greenspace and Downtown connections, which city research show ARE HIGHER PRIORITIES. Existing Park and Open Space are ELIMINATED from current conceptual plans, to be “considered” later in undetermined designs. NOT A PRIORITY. Unsupported priorities like the MULTI-POOL SWIM COMPLEX ARE FIXED TO THIS COMMUNITY CENTER AND MEASURE. In the City funded 2012 Godbe Research poll, Los Altos residents ranked "building a community pool facility" DEAD LAST and NOT IMPORTANT at all. And WITHOUT quantitative utilization studies or visitor analysis on the current Community Center, how can validated priorities be made for future facilities? Los Altos Deserves Better. Vote NO. Hillview Community Center needs replacement, but NOT UNWARRANTED EXPANSION and ADDED COSTLY FACILITIES that are not understood or budgeted. Nowhere does the Argument for Measure A mention costs. The plan estimates $87 MILLION for construction only — paid by a citywide $65 MILLION 30-year variable property tax increase, EXCEEDING $100 MILLION with interest, and $25 MILLION drained from City Reserves. Further, this annual tax is not fixed, and does not exempt seniors and those on fixed incomes. Measure A nearly TRIPLES THE SPACE CURRENTLY USED BY THE COMMUNITY CENTER without studies, data or analysis to validate the need for a 55,600 square foot center rented out to cover unidentified operating costs. Measure A adds a supposed “self-supporting community pool facility” with a 3-pool complex locking in competitive teams and training instead of recreational use. Residents pay taxes to build the complex, then pay again to use it. This facility does not include plans for insurance, operating costs, maintenance, or repairs to make it “self-supporting”. Other cities found operating expenses for pools unlikely to breakeven requiring taxpayer subsidizing. 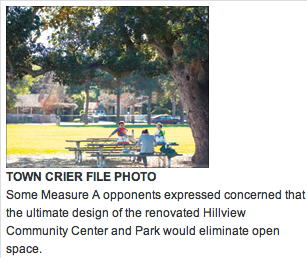 Measure A proposes to expand Hillview Park and Open Space, yet no provisions for non-rented, public use green space are in this plan. Measure A is NOT SUPPORTED by a broad cross section of residents because it is committed to wrong priorities, lacks critical analysis, ignores City funded surveys, and minimizes true costs. Measure A is not in keeping with a right-sized, financially responsible plan.